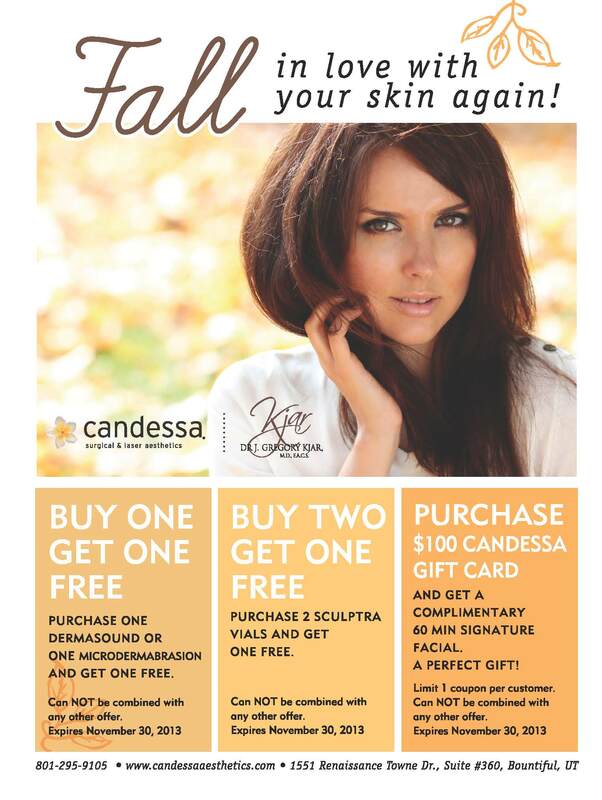 Microdermabrasion & Dermasound: Buy one, get one free. Microderm uses crystals to polish the skin’s surgace and simultaneously suction it away. The vacuum effect helps cell and collagen production. This treatment also includes a facial masque and relaxing massage. This treatment lasts 45 minutes and is $70. Sculptra Injectable: Buy two, get 1 free. The average client needs 3 vials. Replace lost collagen in your face by getting Sculptra Aesthetics. Laser Hair Removal: 40% off any laser hair removal package. Our new laser is virtually painless and efficient. Free Facial: Purchase a $100 Candessa Gift Certificate and receive a complimentary signature facial. This facial is 60 minutes and is a relaxing, customized, journey that will hydrate, brighten and nourish the skin on every level.